A Salmon's Journey Upstream: A traveler leaves the saline safety of his ocean home and embarks on his soul-mission, facing the unexpected challenges of navigating hundreds of miles upstream. Up, he swims. Up, up, up. Driven by a greater purpose, he jumps over rapids and pauses for half a second to notice a green world, dripping in saturated chlorophyllic color. The licorice scent of tree ferns and spicy lemony scent of douglas firs fill the air, freezing the moment. He has a vague sense he’s seen this before, a long time ago. And he has. Because this upstream journey means he is coming home. Salmon begin their lives in freshwater lakes, streams, and rivers, them migrate to the ocean where they spend anywhere from 2-7 years at sea (depending on the species.) After their long time spent in the ocean gathering nutrition and growing big and strong, they make their uphill return trip to those freshwater spawning grounds to spawn a new generation of life. They are reliant on the cool shaded forests of the Pacific Northwest, and on the trees that keep their environment shaded, moist, and healthy. And it turns out, the forests rely on those spent salmon just as much as the salmon rely on their great upriver spawning locations. 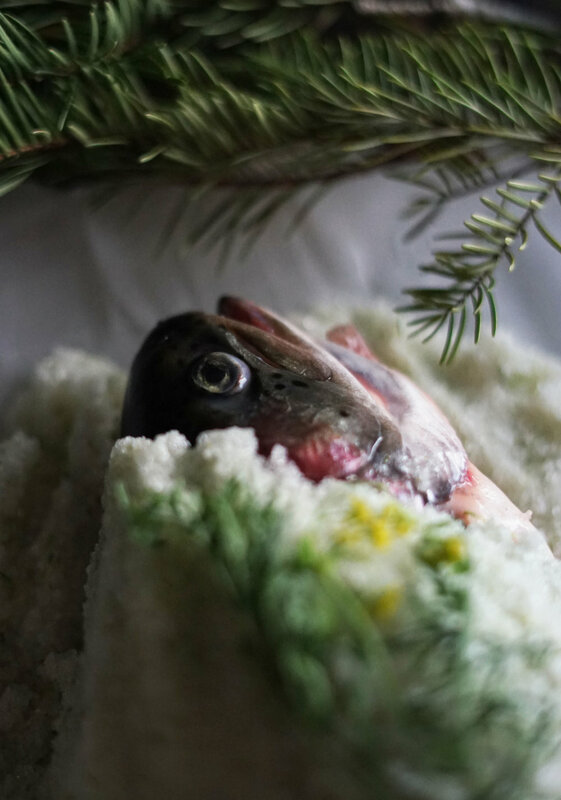 The decaying bodies of salmon import vast stores of nitrogen to the forest ecosystem, thereby supporting many other generations of life - the trees, the plants, the animals that eat them. Bears catch these salmon and drag them off into the forest. These carcasses are left to decompose there, feeding other animals and birds of the forest and nourishing lots of plant life as well. Findings by Biologist John Reynolds show that bears take about 80% of their salmon run into the forest. He calculated that during the 40 day spawning period, each bear carried about 700 salmon (amounting to 1,600 kg of fertilizer) far into the woods. As he started doing tests on the trees in these forests, he found that up to 50% of the total nitrogen the trees use comes from salmon. (A similar study by Robert Naiman at the University of Washington states that stream side vegetation gets just under 25% of its nitrogen from salmon as well; other researchers report that up to 70% of the nitrogen found in riparian zone plants are from salmon.) These trees then grow big and strong to shade streams and provide safe spawning locations. As the trees die, fall, and decompose, that same nitrogen is released back into the stream, feeding the plants and insects that new generations of salmon fry rely upon. This reminds us all of just how interconnected we are with the natural world. Beautiful and fascinating cycles are happening all around us and even to us without our notice. This dish is in honor of the salmon and their relationship to the rainforests and trees. 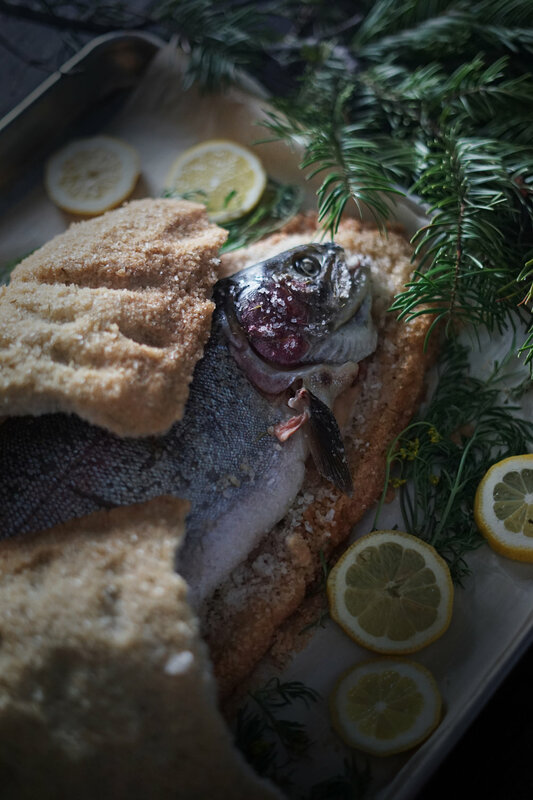 These tenacious and magnificent fish deserve our deepest respect, which is why I chose to roast one whole in a fir-infused salt crust. My desire to honor this fish comes both from my own personal reverence for them and their life cycle, but it also follows in the footsteps of the beliefs of several local Native American tribes, who celebrated salmon in a spiritual context. They believed these salmon willingly gave themselves up as food for humans and therefore should be honored at feasts and ceremonies. The salmon is often used as a symbol of renewal and prosperity. This time of year in Idaho, the salmon runs begin. After spawning, these flavorful fish are caught by bears, eagles, humans, and other animals. These fish are depleted after their long journeys up to spawn, and only the youngest and strongest will return back to the ocean. The rest will stay here to feed our trees and our forests. I really love preparing fish in a salt crust. It feels like a subtle way to honor the fish itself through elegant presentation, and it always wows my dinner guests. 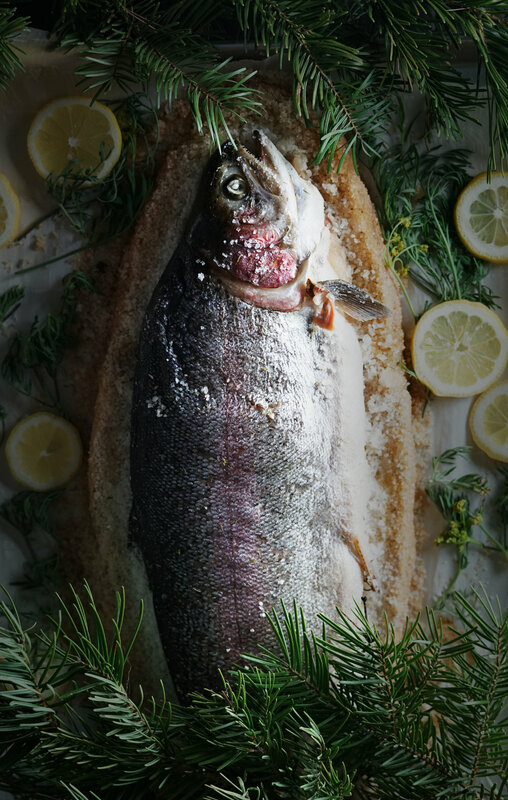 To make it, it’s as simple as stuffing a fresh salmon with lemon and herbs and then covering it in a fir-infused salt crust before baking. The fragrant scent of the salt crust speaks to the salmon’s relationship with trees, and it also keeps the fish super moist as it cooks. It’s fun to crack through the hardened salt to reveal dinner, perfectly cooked and expertly flavored. All it needs is a little drizzle of lemon juice to be absolutely perfect. I decided to use biscuit root (Lomatium family) as a flavoring for my salmon, since it is another plant that grows in the river canyons that the salmon I eat swim up. It tastes a bit like parsley, only more wild and more intoxicating. It also bears a resemblance to deadly poison hemlock, so if you are gathering your own you should reference multiple guidebooks and be absolutely certain of your identification. You can also substitute other herbs instead - fennel, dill, or parsley would all be tasty! Before we get to the salmon-baking, a few notes on lomatium as a flavoring: this member of the celery family grows all over the Pacific Northwest region, especially on dry rocky outcroppings. It is known more for its huge resinous roots than for its foliage. Those roots can be roasted and eaten or used for a number of other things. Native Americans in the inland northwest relied on it as a staple food. It’s also full of antiviral, antibiotic, anti fungal constituents, which has led to its use in herbal medicine for hundreds of years. My personal interest in this plant, though, is for the foliage and flowers which contain a savory and slightly spicy scent reminiscent of celery but a little more floral. I like to dry the leaves and flowers to add to salt seasoning blends later in the year and it makes the perfect accent to lemon-baked salmon. Preheat oven to 375F. Cut the bottom of the fish open and clean it (if that hasn’t been done already), then fill the cavity with lemon slices and fresh herbs. Pulverize the fir needles with about 1Tbs of salt until they’re broken down into small pieces. Whip the egg whites until frothy, then add the fir needle salt and the rest of the salt slowly. The mixture should be the consistency of mold-able wet sand. If it’s too crumbly, slowly add some water, 1 tsp. at a time. Line a large rimmed baking sheet with foil or parchment paper. Spread 1/3 of the damp salt in the shape of the fish on the paper to make a “bed” for it. Place the fish on top and cover it with the rest of the salt mixture in as even layer as possible. Gently pat down, and decorate if desired. Bake the fish to an internal temperature of 135-140F. For a small fish (1.5 lbs), this will take about 25 minutes. For a larger fish (like a 5 lb fish) this will take about twice as long. Use a meat thermometer to probe in and check doneness after 20 minutes of cooking. Once the internal temperature of the fish has reached 135, remove it from the oven and let stand for 5 to10 minutes before serving. Crack the salt case with a wooden spoon and remove the hard chunks. You can also use a bread knife to cut around the outside and lift the crust off in big chunks. Filet the fish, removing the skin if you’d like (it’ll be very salty.) Sprinkle with fresh lemon juice and freshly chopped herbs and serve! As you serve and eat it, be careful to watch out for bones - though most of them will stay intact and attached to the skeleton.